Two small clinical studies show brain changes among young football players with a history of concussion and exposure to high-impact hits. (Inside Science) -- Two clinical studies in which a handful of young football players in North Carolina were asked questions to assess cognitive performance before and after the season and also given brain scans yielded new insights into how the sport affects young players. There were measurable changes in the brains of players with a history of concussion and players who are exposed to head impacts during a single season of play. The studies were too small to broadly generalize whether this happens to all young football players, and more work is needed to understand what exactly the detected changes mean. Brain changes alone are not necessarily cause for alarm, and indeed the brains of children and adolescents are already undergoing rapid developmental changes. 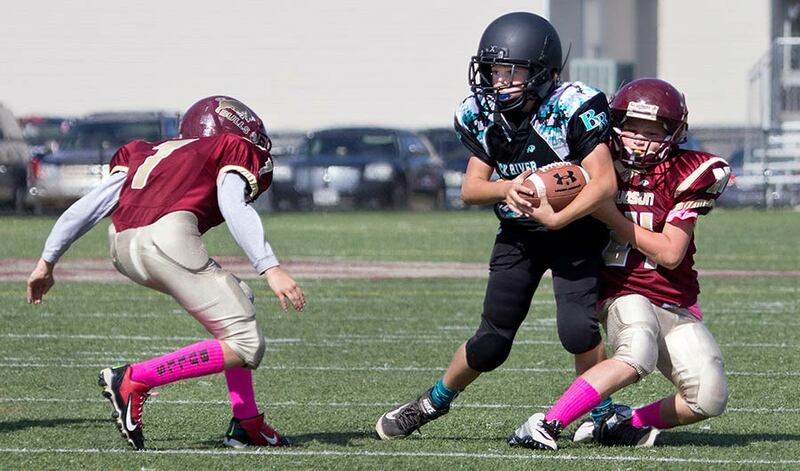 Concerns about potential damage to young brains are part of the reason why lawmakers from Illinois and New York have recently announced legislation that would ban tackle football in their states below the ages of 12 and 13, respectively. Nevertheless, the new research is significant because it shows that changes to the brain linked to concussion and head impacts may be measurable with brain scans -- something that holds promise for diagnosing and treating concussion in the future. Concussions are considered a mild form of traumatic brain injury and not readily visible on MRI or CT brain scans -- the way that say a skull fracture would be apparent on an X-ray. One holy grail in sports medicine is to find a way to use some kind of imaging technique to improve their diagnosis and treatment. "It’s really hard to diagnose concussion," said Max Wintermark, a radiologist at Stanford University in Palo Alto who was not involved in the studies. "That’s exactly the issue, because you know when you have football players, military personnel, sometimes they have symptoms and when you do the CT scan or the regular MRI, you don’t see anything." Many experts believe that an imaging "biomarker" of concussion may be coming. Two new studies by a group of researchers at UT Southwestern in Dallas and Wake Forest University in Winston-Salem, North Carolina, which Wintermark called "promising," were presented last fall at the Radiological Society of North America meeting in Chicago. The same team presented related work at the 2016 instance of the meeting. Wintermark was not involved with the study but did serve on the society's public information committee that selected the studies to highlight to the media. The new work was part of a larger study started in 2012 called ITAKL, or Imaging Telemetry and Kinematic Modeling, one aim of which is to find ways of imaging the brain that will allow doctors to detect concussions and guide treatment for people who suffer them. Hundreds of young athletes have participated in this study in the last half decade, and doctors from UT Southwestern and Wake Forest collaborate with the players, coaches and parents to study the effects of concussion and other forms of head trauma on young athletes. The athletes play their entire seasons wearing a device called a Head Impact Telemetry System, which has six accelerometers in it and quantitatively measures hits to the player's helmet during games and practices -- how hard, fast, and from which direction they came. The players also underwent cognitive testing before and after the season and sat for MRI brain scans as well as magnetoencephalography or MEG scans, which measure the magnetic changes outside the skull that result from brain activity. One ultimate goal of the work, Elizabeth Moody Davenport, a postdoctoral researcher at UT Southwestern said, will be to identify ways to modify the game to make it safer -- through better equipment, new rules of play and new standards of practice. "Little league baseball has a pitch count," she said. Pitch counts are used to limit the risk of injury by capping the number of pitches a player is allowed to throw over a given amount of time. The first study was designed to look at sub-concussive impacts -- blows to the head that do not cause a concussion -- and what effect a history of concussion has on them. It involved 20 high school football players, five of whom entered the season with a history of at least one concussion as reported by their parents. Using MEG scans, the researchers studied the impact of a single season's blows on a connected set of brain regions known as the default mode network, which one researcher described as the "zone out" network. "It’s what you do when you’re introspective, you’re just kind of day dreaming, not paying attention," said Davenport, who presented the study in Chicago. "And it’s a good measure of brain health." Looking at how the default mode network connectivity changed over the season for the players, they found that those changes depended on if they had had a concussion previously in their life or not. The five players with a history of concussion had significantly lower default mode network connectivity after the season compared to those without a history of concussion. This demonstrates that a history of concussions may reduce the brain's ability to compensate for later impacts, Davenport said, though the long-term effects of those changes remain to be seen. The second study used a technique called fMRI to scan the heads of 26 football players between the ages of nine and 12. Unlike regular MRI, where you may image the structure of the brain, fMRI looks at the way the brain functions by measuring the fluctuation in the brain activity. In this study, the 26 players were segmented into two groups of 13 depending on whether they were classified as having received high-exposure or low-exposure to head impacts, based on number crunching and the data their helmets recorded. These two groups were then compared to 13 other young athletes who had similar body-mass indexes but played only non-impact sports like swimming, golf or running. The researchers used an artificial intelligence technique called machine learning to evaluate the fMRI results. Using an algorithm developed by graduate student Gowtham Krishnan Murugesan, the method predicted whether each scan belonged to the group with high-exposure to head impacts, low-exposure or the control. It did well at teasing out the high-impact hitters versus controls, doing so with 82 percent accuracy. It also did fairly well discriminating the low-impact hitters versus controls, correctly predicting them 70 percent of the time. "It tells us that whatever your head impact is, low or high, there’s still an effect on the brain," Davenport said. In order for the results to be validated, they will need to be observed again in a larger population. "We’re talking about 26 football players, so it’s a really small population," Wintermark said. "In such small numbers, you have always to take this with a grain of salt."